With features like a wide 70 degree apparent FOV, five elements of fully multi-coated high-index glass, beautiful black anodized body and barrel, the Agena Super Wide Angle (SWA) eyepieces are as close as you can get. These eyepieces will give you crisp and wide views of the Moon, planets, galaxies, nebulae, and star clusters, rivaling the performance of much higher priced eyepieces. 4.9 (Based on 26 Reviews) 100% of reviewers recommended this product. I recently bought a celestron 90 which is my first my first telescope. I use it primarily as a spotting scope and I must say this swa 15mm works very well for this application. Price was okay too. The swa 15 is a perfect match as a planetary for my C90. Great views of Jupiter, Saturn and Mars. Love this eyepiece! The wide field is fantastic in my 90x1000mm F/11 refractor for star-hopping, and orienting to targets, and sharp to the edge. In a single night of viewing with this as my go-to searching piece, I was able to locate Neptune, Uranus and Andromeda within minutes; the 70 degree field makes it too easy! Super sharp views of the Moon through this awesome piece as well! This outstanding optic has officially laid my 15mm Kellners to rest. I wanted a mid range wide eyepiece, and this is just what I wanted. It's lightweight, easy to focus & seems good even around the edges. I liked it enough I bought the 20mm also. This eyepiece will not disappoint! Very reasonably priced. Review by Warwolf of Puerto Rico. I already had 3 years of experience using telescopes but it wasn't until not long ago that I finally got my first telescope. This was the first EP (and the first from Agena) I bought. I must say that the product performed very well and the quality is great. I really like the contrast it provides, objects look very sharp. It is my main EP for public gatherings since people with different eye conditions are able to view the objects without issues. In short, you can't go wrong with this EP! Review by CincyAstro of Cincinnati, OH. Very happy with this EP. I wanted to try out a wide angle EP and I was on budget and figured I would give this one a try. I can say the first time I used it, I used it all night because it was great to get a nice wide angle view. Quite impressed at the quality for the price. Review by Ignacio of Orlando, FL. This is an excellent eyepiece. The 70 degrees provides a wide angle view in a very small and light weight format. I have a Hyperion 13mm eye piece and this SWA provides views as good as that one without the weight or size of the 13mm (granted this SWA is a 15mm). Stars look sharp all over the field of view. No coma and I cannot see distortion on the edges. Quality is great. My only gripe is with the top lens cap which is a little bigger than the eye cup, so it does not remain in place securely. Other that that minor thing the eyepiece is well constructed and provides great views without having to carry a big eye piece. Very convenient. Review by Astrolabieff of Russia, S.-Petersburg.. This eyepiece I use for a telescope with a focal length of 1300 mm, MAK-102 mm. This eyepiece is very good quality. It provides images with an increase of about 86-x. This increase is convenient when observing the moon. The moon almost completely fills the ocular field. The eyepiece provides sharp and high contrast image. It was during this eyepiece I saw the most detailed image of Jupiter (this winter). In this eyepiece I watched Jupiter, moon and Venus. Beautiful and compact eyepiece. Review by ecuador of Manchester, UK. The 5 stars of course are taking the price into account. If you want a very wide angle eyepiece to enjoy some DSOs, then you can't get anything better at a similar or even a bit higher price. On a fast scope (e.g. an f/5 reflector) you can see that the edges are not that sharp, but to correct that you will need to spend more than twice its price. So, satisfying views in general, amazing value. Got this so I could do eyepiece projection prominence photography with my Ha solar telescope. Results were very good. Review by Amit kumar of India. Fantastic eyepiece, especially for the money. Performs very well in both my f/10 8" SCT and ETX-70. It's great to know that even though I can't spend hundreds of $ on a TeleVue or Explore Scientific eyepiece, I can still get such amazing quality and performance at a price that's affordable. Don't even hesitate to get any of the Agena SWA's. Review by rainguy of Lake Oswego, OR. I got this to use with my Orion StarBlast 6 to increase magnification while maintaining a wide, sweeping view, mainly higher mag than my 25mm Plossl without giving up the panorama. The Agena 15mm SWA does this admirably. An excellent rich field observing lens with sharp images. It also works well with my 90mm Mak, opens up the field of view a bit with decent mag. Review by R of Portland, OR. One of my favorite EP's. Beautiful wide views, perfect for scanning the night sky. Review by Rublrzn of RU. Review by AstroGeorge of Europe. Got my first set (10mm,15mm,20mm) three years ago, only to sell it a year ago to fund other projects. Once cash started flowing again I ended up buying the 15mm and the 20mm again. They are of excellent quality and I use them primarily for DSOs. Highly recommended ! Review by Jaymz007 of Madison, WI. I purchased this used but thought I would write something quick here. The e.p. is very well built and feels like quality. Through my Celestron 102mm f/10, images are crystal clear, bright and very satisfying. Tonight the moon was half full. It takes in the whole view in my scope and is tack sharp with some very slight degradation (very slight) at the last maybe 2% of the edge. Other than that what I consider very acceptable performance, this is absolutely perfect and WELL worth the money. If I had to compare it with my favorite e.p. of all time (Meade 4000 series 8.8mm UWA)where that is a 10 out of 10 (to me), this would definitely be a solid 8.5. Again, this is my opinion and beauty is in the eye of the beholder. I'll be purchasing the 20mm and 10mm before I leave this website :) Keep looking up! Great views, wide angles, clear planets, nice case that comes for free. Upon purchasing my 8 inch Dobsonian, I got rid of my original eyepieces being a 9mm and 25mm. I decided to purchase a 15mm and 10mm with the huge 70 degree field of view. I was amazed by the clarity of these eyepieces, and strength of them, and the huge wide views they provided. The 15mm almost acts a standard 20mm plossl, but with the views being more powerful due to the 15mm lens. I love these eyepieces and I'm sure any other amateur astronomer would enjoy them too. Review by Aaron from P-Town of Milwaukie, OR. I own two of the SWA eyepieces and I love them both equally! The 10mm gives me nice views of Saturn and it's rings, and the 15mm gives me splendid views of the moon and Jupiter with all of it's moons in view. I get a lot of ohhhs and ahhhs with these eyepieces and I'm sure you'll get the same too! FANTASTIC value and a great eyepiece! I use this eyepiece in a F/6 Dob and a F/9 refractor and the views are outstanding in both. Excellent contrast and tack-sharp edge to edge images. Superior coatings and solid construction. I have compared this eyepiece to "big name" counterparts and the Agena Astroproducts line blows them away!! Same results with the 10mm 1.25" that I also own! You will not be disappointed with this eyepiece!!! Review by cah of New York, NY. 4.0 Very Good for Binoviewing! Good quality for the price. Best with longer focal-length scopes because of some loss of edge sharpness. In pairs, they are very good for binoviewing. Review by kid-cincy of Cincinnati, OH. I ordered this EP a few months back, and then ordered a 13mm Hyperion not long after. I love the Hyperion, and use it frequently, but it recently got smudged, and I needed something in the same focal range. 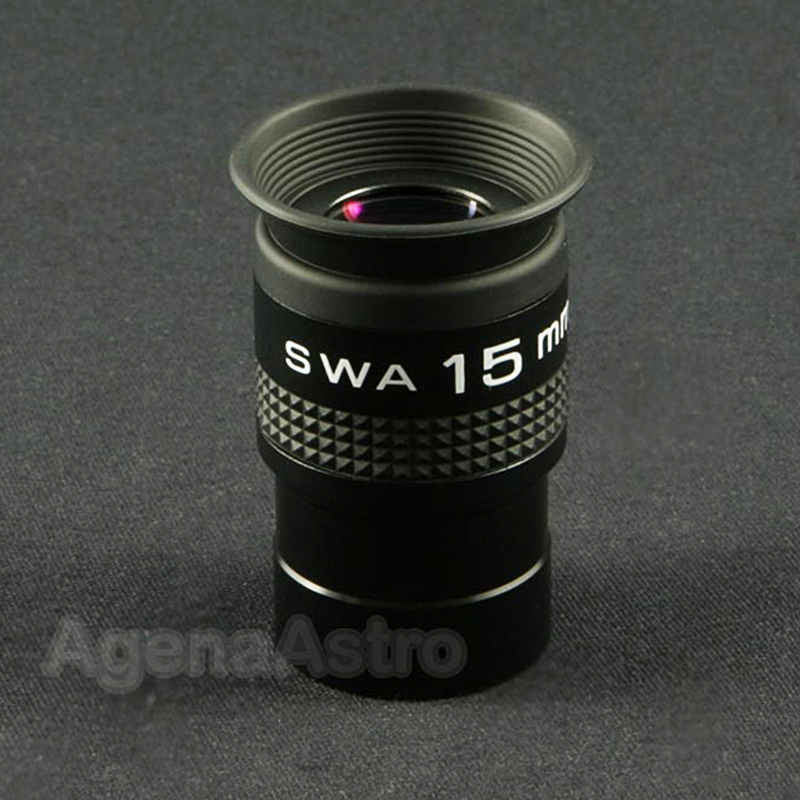 I grabbed the Agena 15mm SWA and was pretty much blown away by the clarity and AFOV. I've used it for globular clusters, and the clarity of the individual stars is just terrific. I also use it for viewing Saturn, and often use it in conjunction with the 2.5x GSO barlow that Agena sells. Last night Saturn came in crystal clear at an effective 6mm (15mm SWA + 2.5x barlow), which in my scope is 200x. I bought this Agena 70* 15mm used but it was in new condition! The color corrective coatings are very good! The eye relief is great! Since I do a lot of imaging and viewing, parfocal is a must and this has that! So I can say by using this for the past 2 months, I am very pleased with the views! No false color; parfocal; clear bolt case! The top lens cap wont fit inside the bolt case, but its nice to have!! I bought this Agena 70* 15mm used but it was in new condition! The color corrective coatings are very good! The eye relief is great! Since I do a lot of imaging and viewing, parfocal is a must and this has that! So I can say by using this for the past 2 months, I am very pleased with the views! It comes with a nice clear bolt case which makes it very easy to see the size of the EP!